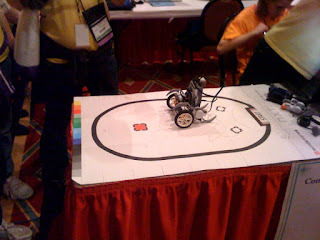 Views From the Lamb's Herd: Student showcase #petec2010 "I built this and it uses a simple program". Student showcase #petec2010 "I built this and it uses a simple program". was really enthusiastic. To him, programming a LEGO robot is "simple." How would you challenge this student in your classroom? Catch the Google Wave - WOW!